Who said upside down cakes have to be pineapple? While I love them too I’m very enamored with this Pear Upside Down Crunch Coffee Cake; it’s easy and delicious! Bread or cake? Sometimes it’s hard to tell, especially with quick breads; except for the pan they’re baked in they often seem to fall closer to the cake group. The items on this document from the University of Kentucky College of Agriculture consider a lot of our everyday baked goods as quick breads – those breads that do not require yeast. The list is long and varied and includes muffins, coffeecakes, scones, waffles, and pancakes. Coffeecakes? Who knew? Although quick and yeast breads are typically categorized because of the leavening agents, all quick breads are just that: breads that can be made in a short period of time and with very little effort. What is there not to love about that? And that is what I loved about this coffee cake. Easy and amazing too. I don’t think I baked with pears until a few years ago and now I look so forward to them showing up in the market each fall. This Upside Down Pear Crunch Coffee Cake is now officially on the list of why. Although I love occasionally making a loaf of yeast bread (especially focaccia and challah) I have limited time to be paying attention to rising so you’ll most often see something quicker on this site. I only wish I had the the time to proof yeast and knead and…no I don’t. I’ve never been one to get the joy from that activity that others do; maybe it’s my tendency towards carpal tunnel when kneading which can lead to my hands killing me all night long? Yeah…that must be it! I was recently asked if I would like to use this recipe from Elizabeth Falkner who some of you may know from the Food Network. She has a new restaurant, Krescendo, opening in Brooklyn, has appeared in several culinary competitions and is the author of ‘Cooking Off the Clock: Recipes From My Downtime‘ published just last month by Ten Speed Press. Look for her in the Food Network’s ‘The Next Iron Chef – Redemption” competition too; she is a character and I only wish I could see her in action but I no longer get the Food Network…invite me over, OK? Elizabeth has partnered with gourmet gift retailer Harry & David for a Seasonal Chef Program. She created three seasonally-inspired recipes including this Upside Pear Crunch Coffee Cake, an easy-at-home recipe which is a fabulous breakfast treat for next Sunday or for your holiday dessert table. I recently received a gorgeous basket of fruit from Harry and David and can attest to the quality of their pears…they are the BEST! While we struggled a bit deciding how to place the pear slices ‘just right’ it didn’t really seem to matter. What I loved? My daughter and her friend were here and they not only went on and on about the fabulous scent that enveloped them when they walked inside the foyer but were even more taken with the final result. It was simple and stunning. And guess what else? Quick! Really nothing difficult at all but something magical happens at times with a combination of ingredients and this bread is the perfect example. A moist and rich cake (oops, I mean bread) with pears and a brown sugar and butter topping. Umm, umm good! An upside down pear coffee cake with a brown sugar and cinnamon topping. Work all ingredients together with a food processor, spatula or your fingers and set aside. Preheat the oven to 325 degrees convection. (Without a convection oven, baking will take longer). Add the eggs and combine to mix thoroughly. Add the sour cream, milk and vanilla extract and mix into butter and egg mixture thoroughly. Spray the inside of two loaf pans with vegetable oil or rub lightly with butter. Sprinkle half of the topping mixture divided between 2 loaf pans. Divide the pear slices lined down each loaf pan on top of the Crunch layer. Divide Coffee Cake batter over the pears in each pan. Finally, divide the rest of the Crunch over the batter in each pan. Bake for 30 minutes until cake is set. Cool completely, this takes awhile, be patient. Then invert cake upside down when cool, slice and serve. The recipe I received called for 30 minutes using a convection oven. I'm lucky to have one and because I'm at altitude I increased my temp to 350 degrees. We had to bake this coffee cake for an additional 20 minutes at least so I've indicated a bit longer baking time but please be sure to test with a toothpick; it should come out clean after inserting into the center of the cake. This was delicious. Will definitely make again. Instead of 2 loaf pans, has anyone tried a 8 or 9 inch square baking dish? I haven’t Louise but I think you could try that; the larger 9 inch square would be a better choice because it has more volume. You’ll just have to line up two rows of pears and then when you bake it check regularly with a toothpick to determine when it’s done since that time might vary. Let me know how it turns out! This is a gorgeous quick bread/cake. I can understand why everyone loved not only the tease from entering your house but the actual taste! Thank you Betsy; I’m so fond of pineapple upside down cake that I might have not given other fruits a change; glad I did with this one. WOW. I love the idea of using pears this way. Your bread looks perfect too. Elizabeth’s book sounds amazing. Thanks so much Sherron…I don’t often think of using pears for breads but this was perfect. This looks wonderful, so moist and delicious! I so wish I’d gone with a quick bread this month, ah well we live and learn! Great loaf Barb! I think I’m vying for the quick bread queen title. I love making yeast bread but have precious little time for them. This was fabulous too…I love pears in baked goods; far more than I do raw. Well, I completely messed up for this month’s #TwelveLoaves. I thought the theme for this month was fruit and not specifically apples and pears. My bad. I made the most incredible cinnamon raisin bread for my submission and now I realize that made it only for my own enjoyment. Boo Hoo. LOL I’ll have to be more careful in the future. That said, I think I’ll still submit it if it’s OK? Do tell. I think times like this show what it’s really like to be a cook…an oops is always part of our experience…let’s share those too! I’m new to your site and cannot wait to search around for more enticing recipes! This one really caught my eye. Adding it to the Thanksgiving menu for sure! Finally got my post up! I had fun making my recipe for #Twelve Loaves. Thanks for letting me join in the fun! How scrumptious, I love the pears! Making bread is one of those things that terrifies me. Granted I have a bread machine and have made it a few times but to make a loaf from scratch – not a mix… I swear Barb – y’all inspire me 🙂 I might have to give #TwelveLoaves a whirl. I’m more of a quick bread baker, yeast breads have always been more of a challenge and time commitment whereas quick breads have more instant gratification and I have to say I love that! I have only attempted an upside down cake of any type once and well, it didn’t go so well. I think that’s scared me off from reattempting. This looks fabulous! It may inspire me to give upside down cakes another shot. In the meantime, I can’t wait to start thinking about what I’ll submit for Twelve Loaves this month! Oh you HAVE to try again…that magic of sugar and butter in the bottom is one of my most favorite things! I can’t wait to see what you do! I have never done pears like this and they now rival pineapple! Well she’s coming back…I like her too…her independent spirit is fabulous and I’ve always loved her wacko cake creations. 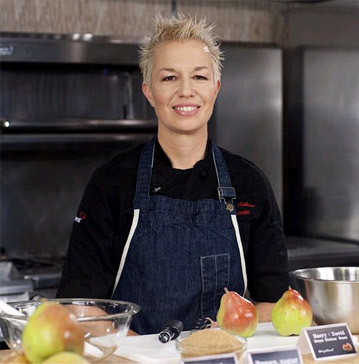 I don’t miss a lot of the Food Network shows but she and Alton are missed. I like characters! Yum this looks really good. I have been wanting to make pear upside down something for a while. I will try this recipe soon! I like doing both too…I just find juggling the real job and the blog job leave me little time to devote to yeast breads; quick breads work on so many levels…including that quick business! 🙂 Love to have you join us! The top (bottom) of that bread simply glistens with syrupy sweetness. What a beautiful bread and then to read that it smells ambrosial, I’m sold. I definitely consider “quick” breads bread – yeast breads are great, but they’re just one type of bread (admittedly, a very popular one). Anyway, this looks terrific. I enjoyed baked pears, and it’s nice to include them in a nice bread like this. It’s really pretty, too! Good stuff – thanks. Being a resident of Canada I’m not entering for the book giveaway but had to comment anyway and tell you how wonderful your pear crunch coffee cake looks. I can also imagine how good this would be using apples as well. Thanks for sharing the recipe Barb. We have to work on these folks…mailing a book to Canada is not that big of a deal is it? Anyway…it is lovely and I agree, apples would be fabulous too. Must make this for a luscious Autumn brunch! !….Question…I have a husband with an unfortunate aversion to pears…could I possibly sub apples or another fruit?…He loves the crunch part (as do I! )….Thanks so much for sharing this splendid recipe! I’ve only done it with pears but don’t see why apples wouldn’t work well too. Plenty of time for them to bake in the pan and soften. Try it…and if you do it this month; be sure to come back and share it with us! This sure is mouthwatering! And I can’t wait to try it on my own! I just love pears! It’s the first time I’ve made an upside down something with pears…we just loved it! This looks great. I always send Harry & David baskets to my grandmothers around Christmastime and wish I lived closer to them to make this recipe. I’ll get started thinking about what to make to join you for Twelve Loaves this month! Don’t they just have beautiful gifts Holly? So glad you’re joining us…though you know we should be planning better so we could get together and nosh on both of our creations over a cup of coffee. Gorgeous bread! Just lovely. For me, pretty much anything that involves dough I call bread. Yeast or not. Biscuits, cornbread, crackers…whatever…and I love them all. But my favorites have always been quick breads. So fuss free and so tasty. Just can’t beat them. See…a woman with a vision that makes this category thing vanish…I like including all sorts of things and I’m also with you on the quick breads. Wish I had the time but I don’t for the longer time required for yeast breads. I love quick breads and yeast breads. Pumpkin chocolate chip quick bread is always a favorite around here. Your pear bread wouldn’t last long either. I love them both too but I sure do make more quick breads. After making my own challah recently, I’m totally smitten with it. Looks wonderful Barb, think I will make it right now! Thanks Suzanne…wish you could just come over; I’ll serve it to you. Coffee too? Would love to, perfect with coffee and of course after that I would have to have one of your brilliant drinks. I was just thinking the same thing… bread – quick bread – coffee cake and want to make a yeasted coffee cake for Twelve Loaves – when I get my kitchen back! This cake looks just scrumptious and perfect for breakfast. And we need the comfort an fruitiness of this right now. I love it!